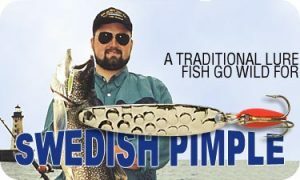 Jigging with bait on a Swedish Pimple while still fishing, vertical jigging, slow drifting or ice fishing for lake trout, pike walleyes, salmon, bass, whitefish or stripers is very effective. For lakers, use our Swedish Pimple #9 – 1 5/8 oz. # 8 – 1 oz. Or #7- ¾ oz. Weight in relation to water depth. Use wire line in really deep waters, Dacron line for less stretch in moderate depth and monofilament for shallow water (30 feet or so). Often the lure will angle run out 20 feet or so by the time it reaches bottom. Take in 5 feet of line fast and let the lure work back to directly beneath you. Wait to bit to take the followers! None? Let the line out to find true bottom. Take up the slack an extra foot. Mark the line at the guide for the next run. Start your jig routine of bob, wait, shimmer, wait and bob. On any laker hit, strike at once. They usually don’t toy. If you miss, continue to jig slowly. Lakers often slash at a bait and come back for it again. On any retrieve of line to check the bait, use the same routine on the way up in case of a stray. Rebait with a fresh cut for taste and odor, repeat the free run. In some areas a white or yellow strike zone flipper instead of red may work better. As a rule, the favorite finishes in order are Nickel, White Pearl, Gold, FYN, FON, PFO, PFY, NB and Prism colors of ZY, ZR, ZB, ZG CH, GLO, LV. For most trout salmon and whitefish. Some specialists also make up a rig of a 3 inch dropper of mono, a single 2/0 hook on the end and one at 2 inches. The dropper is tied to the split ring treble hook removed and the single hooks buried in the cut bait slash. Always keep the dropper shorter than the lure body to prevent fouling when jigging for lake trout and salmon. This same rig, but with a #6 or #8 single hook and tiny bait is a favorite smelt bait on Lake Champlain. This also works well on most pan fish. Many whitefish specialists use this dropper rig with a #6 treble hook and yarn fly. They also often add a treble hook to the top split ring, small flippers and beads on each barb to take their limit daily. Warm all beads to soften them. In fishing for whitefish, set the hook firmly, but without a jerk. Play them carefully as they have soft mouths. A gaff hook is the surest way to get them out on the ice. Try any rig or variation you like but always use the jig routine of fast run, wait, bob, wait shimmer and repeat the bob, wait and shimmer. If the lure fouls the line, reduce the lift and twitch as currents may cause extra action. Our numbers 7N, 8N and 9N are, unhappily, a secret lure for blues, bonita, stripers, kings, cobia and rock fish.